Japanese maples (Acer palmatum) are small, easy-care ornamentals with captivating fall color. They add elegance to any garden when planted alone, but Japanese maple companions can further enhance their beauty. If you are looking for companions for Japanese maples, you’ll have many choices. Read on for some ideas of what to plant with Japanese maple trees. Japanese maples thrive in U.S. Department of Agriculture plant hardiness zones 6 through 9. They prefer acidic soil. 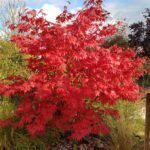 When you are trying to select candidates for planting next to Japanese maples, only consider plants with the same growing requirements. Plants that love acid soils can be good Japanese maple companions. You might consider planting begonias, rhododendrons or gardenias. Begonia cultivars grow happily in USDA zones 6 through 11, producing large blossoms in a vast array of colors. Gardenias will grow in zones 8 through 10, offering deep green foliage and fragrant flowers. With rhododendrons, you have thousands of species and cultivars to choose among. One idea for companions for Japanese maples is other trees. You might mix different kinds of the Japanese maple that have different shapes and offer different foliage hues. For instance, try mixing Acer palmatum, Acer palmatum var. dissectum, and Acer japonicum to create a lush and attractive garden in summer and a lovely autumn display. You might also consider selecting other types of trees, perhaps trees that offer contrasting color patterns to the Japanese maple. One to consider: dogwood trees. These small trees remain attractive all year long with spring blossoms, gorgeous foliage and interesting winter silhouettes. Various conifers can help create a nice contrast when blended in with Japanese maples too. What about other companions for Japanese maples? If you don’t want to distract from the beauty of the Japanese maple, you can select simple groundcover plants as Japanese maple companions. Evergreen groundcover adds color to the garden corner in winter, when the maple has lost its leaves. But groundcover plants don’t have to be inconspicuous. Try purple sheep’s burr (Acaena inermis ‘Purpurea’) for dramatic groundcover. It grows to 6 inches tall and offers brilliant purple foliage. For year-round groundcover beauty, select plants that grow well in shade. These include low-to-the-ground plants like mosses, ferns and asters. Read more articles about Japanese Maple.